that looks like an exclusion from quali..
Romain Grosjean will take third place on the grid with Kimi RÃ¤ikkÃ¶nen lining up sixth for tomorrowâ€™s Hungarian Grand Prix, after a hot qualifying session at the Hungaroring. Kimi RÃ¤ikkÃ¶nen, E21-03. Q: P6, 1:19.851. FP3: P11, 1:21.589. Romain Grosjean, E21-05. Q: P3, 1:19.595. FP3: P1, 1:20.730. Weâ€™re reasonably happy but â€“ of course â€“ we always want more. Everything went pretty much as we expected. For Romain, his single lap and long run pace has been strong and Kimi is much more on top of his car than yesterday. From third and sixth thereâ€™s no reason why we canâ€™t have a strong race with both drivers. We see Sebastian Vettel as our main challenger in the race. The Mercedes did go well in Monaco on a tight and twisty circuit â€“ in the race as well as in qualifying â€“ but here tyre degradation should be more of a factor. This should help us in our fight for a good result. It happened a couple of times and certainly makes for nice slow motion television. He has complained of the rear sliding which has been something weâ€™ve focused on eliminating through setup tweaks. Romain just missed out on P2; how much of a difference is it here between being on the front or second row? Third is actually almost as good as second here as you start on the clean side of the grid and itâ€™s a very dusty circuit. Lewis [Hamilton] and Sebastian were just too strong for us in qualifying, but thereâ€™s potential for us to have a very good race tomorrow. 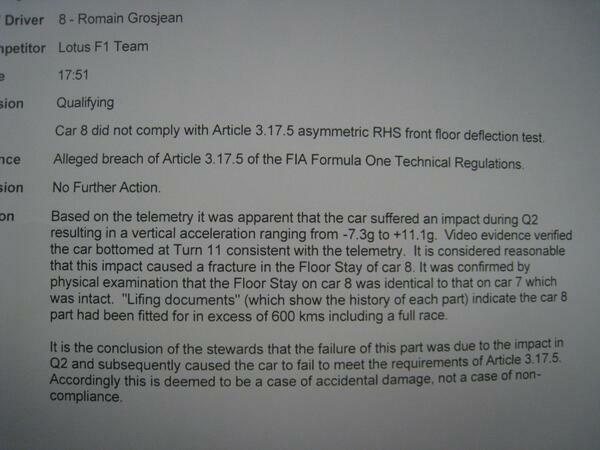 Argument from Lotus re Grosjean floor is he hit a kerb so resulting in greater degree of reflection. Over to the stewards. FIA says "...deemed to be a case of accidental damage, not a case of non-compliance"
Romain Grosjeanâ€™s car failed a floor deflection test after qualifying in Hungary, but after investigating the matter the FIA Stewards did not give a penalty. 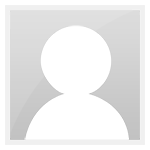 The top three cars were subjected to an â€œasymmetric front floor RHS deflection test,â€� and Grosjeanâ€™s deflected more than 5mm vertically. They accepted that the floor stay was broken after a high vertical loading was caused by hitting a kerb at Turn 11. In fact it was deemed to have ranged from -7.3g to + 11.1g. The stewards also examined an identical part from Kimi Raikkonenâ€™s car and accepted that Grosjeanâ€™s had done 600kms, including a race distance. Changing the tire structure in the middle of the season seemed to hit Kimi RÃ¤ikkÃ¶nen in particular. RÃ¤ikkÃ¶nen lost his sensitivity to manage tires in Hungary practice and the situation wasn't completely in place in qualification either. 6th position in the grid is actually higher when comparing to Saturday practice. â€“ It's not a catastrophy, but it's not an ideal starting position, RÃ¤ikkÃ¶nen described his weekend so far. After going through his tv- and press-interviews, RÃ¤ikkÃ¶nen sat down for an interview with Turun Sanomat. It was clear beforehand that the starting position to make this discussion work was just as challenging as it was for the driver to manage tires a moment before. What is it exactly that's wrong with the tires? â€“ The tires are so different that it has taken insanely time to get them to work the way I want. We have improved little by little, but it still isn't where it should be. Especially front tires have made it more difficult. The car pushes a bit too much. The last corner in particular has been a tricky spot for me the whole weekend, RÃ¤ikkÃ¶nen said. Does the tire reformation make your WDC-battle more difficult? â€“ Well it doesn't help it, that's for sure. I don't think that it will change it much though. The car was already better in quali than it has been the whole weekend. My lap was okay with a pushing car. Of course it took a longer time to get it better through setups. RÃ¤ikkÃ¶nen started 5th in Monaco. It proved impossible to climb up from there. Now he has a new attempt to start from the 3rd row on an almost as curly track as Monaco. â€“ Fortunately this is different than Monaco. Overtaking is difficult, but we have already seen this season how we can improve positions if we get the tires and everything else to work well. When the temperature goes up to 40 degrees, is it an advantage for Lotus? â€“ I don't have the energy to start guessing. It's impossible to say beforehand since we haven't raced one race with these new tires. We'll see it on Sunday. What is the worst track to drive when it's this hot? â€“ In Malaysia it's even more hotter than in Hungary, but Singapore is the toughest one. It feels hotter than in Malaysia, because the track is so slow and there's no decent wind there. As a matter of fact the race there doesn't feel as bad as the pratice does, because we stop all the time and the heat hits all the way to the pitbox. When driving the flow of air helps all the time, RÃ¤ikkÃ¶nen compared. Romain Grosjean beat RÃ¤ikkÃ¶nen in qualification for the second time this season and he snatched superbly the 3rd position. In scrutineering the car's front floor bent against the rules, but telemetry proved that the floor constantly hit in corner 11 which damaged the floor. Hence Grosjean starts the race from a strong position as one of the winner candidate. Then why did the tire fit Grosjean better than RÃ¤ikkÃ¶nen? â€“ We didn't lose much to them and you don't have to fall back much in order to lose positions in the quali, RÃ¤ikkÃ¶nen belittled. Either way Grosjean's driving style, based on more fierce braking and precise turning, seemed to immediately fall in place with this tire structure when compared to RÃ¤ikkÃ¶nen. Will Grosjean help you in the race if needed? â€“ You have to ask that from him, not me, RÃ¤ikkÃ¶nen snapped - and left to his own premises so he could concentrate on Sunday's challenges. What could stir us out of our scribbling at Media HQ? Finnish fans fever as Kimi Raikkonen appears on the big screens here at the circuit. How many points finishes in a row now?